Wild Place Project provides a fantastic opportunity for young people to experience nature in a safe, secure and hands-on way. The outdoor, practical nature of our learning sessions is particularly effective for those less suited to a formal learning environment. We aim to provide positive experiences of nature that will help to build self-esteem and encourage appreciation for the natural world. Learning sessions at Wild Place Project can be adapted for groups with additional needs including mild or complex learning difficulties, as well as physical, emotional and behavioural difficulties. We encourage learning through play in a relaxed setting where we can be flexible according to the needs of the group. 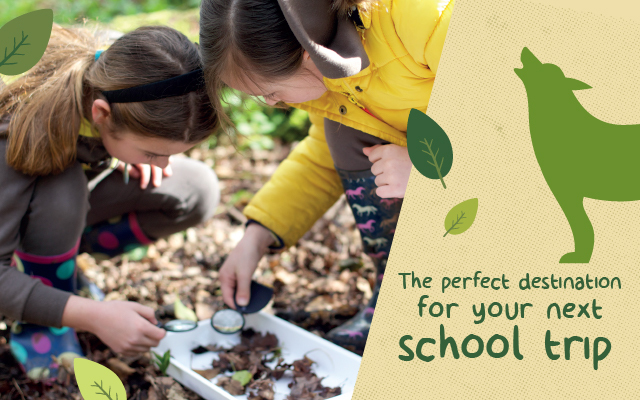 Our learning team has extensive experience working outdoors with children and young people of all ages and abilities. Our toilets are located by the Fun Fort. We have one disabled toilet located on the outside section of the Fun Fort toilets. As Wild Place Project is based on a site rich in natural beauty please be aware that paths can be loose and uneven, so please ensure you wear sensible footing - we would advise against wearing flip flops etc. Unfortunately, this means that large parts of Wild Place Project are unsuitable for wheelchair users. Parking at Wild Place Project is limited; we advise arriving early during peak periods to avoid disappointment. Parking is free of charge. Coach parking spaces are strictly limited, and must be pre-booked. They will be allocated on a first come, first served basis. There are picnic benches in the Walled Garden. Our fun, adaptable workshops provide the opportunity to get hands-on with nature through a variety of games and practical activities. The sessions listed are particularly suited to groups with additional needs. You can also select a session from the most suitable key stage for your group – let us know your needs when booking so that we can ensure the session is delivered appropriately. Through a series of sensory games, pupils explore the amazing world of the wolf and get hands-on with real objects such as furs and antlers. They learn to communicate like a wolf and discover how body language can show feelings. A relaxed session providing young people with time and space, and the freedom to explore the natural environment. A variety of activities may be included to develop communication and social skills, explore the senses, or encourage physical activity – just let us know your objectives. Pupils take part in games and activities relating to animal behaviour, body language and senses. They observe lemurs and interpret their behaviour, and compare this to their own human behaviours including non-verbal signals which convey mood and emotion. Especially suitable for children with autistic spectrum disorders. Pupils explore the woods and meadows and collect natural objects to learn about colours, patterns and textures in nature. Working in teams, they will produce ephemeral artworks and develop literacy by collecting words to describe their sensory experience.